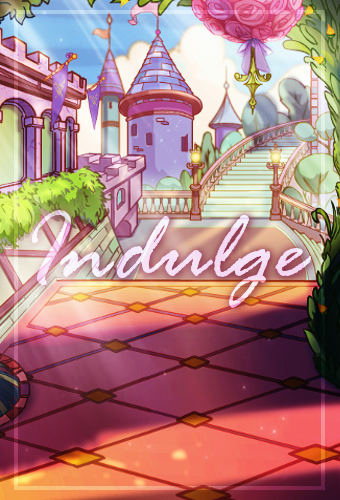 Welcome to Indulge! My name is Tiffany, and I will be your hostess for today. What is Indulge, you may ask? To get straight to the point, Indulge is a site-improvement and help site that opened its doors on February 15,2018. The purpose of this site is to be used as a resource whenever you feel the need to improve your site. Here, my goal is to help you make your site the best it can be. This site will also provide a variety of resources, guides, tips, as well as reviews from time to time. You, as the visitor, will also have the chance to submit any questions and request site reviews. This site should not only serve as a guide, but also a place that helps you improve on becoming a site owner. If you have any questions/concerns, please neomail me. As you walk through the stone paved streets of the kingdom, you come across a small corner cafe with a sign above the entrance reading, Indulge. A group of friends walk out of the cafe carrying boxes of baked goods and treats. Suddenly hungry, you decide to have a look inside. You are immediately greeted with the smell of baked goods and melted butter the moment you enter the building. At the counter ahead of you stands a young girl talking animatedly with a group of customers all laughing and smiling. Upon spotting you, she excuses herself from the group and makes her way towards where you are standing. She introduces herself as Tiffany and shows you to your table with a menu already placed. Continue? 11/02/18- Just popping in to say that I'm still here and accepting requests. So far, I've completed two. I'm still on a hiatus so expect replies and requests to be slow. Read my last update for more information on the hiatus. 09/09/18- HIATUS: From this point on, I will be going on a hiatus. I planned on coming back after my vacation, but one thing led to another, and all of a sudden, school has started again. My classes this semester are more demanding than usual so I am taking a break to focus on my studies. I don't know when I'll be back, but hopefully during the winter. Requests will remain open during my hiatus, but there's no guarantee that they'll be done quickly. As always, feel free to neomail me! 08/07/18- VACATION: I will be on vacation for the rest of this week and half of next so there will be no updates until then. Requests will remain open during this time so feel free to send them in. I will reply when I come back. Hope you're having a fantastic summer! Also, entering and voting is open at my competition site, Demure, so please check it out. Requests are open. Here are all the blogs. Each briefly covers a site-making topic. Read the description below each header to get an idea of what the post is about. This site is written in blog style. Meaning, instead of it being a complete guide, it is just giving you tips and written informally. There are no lengthy articles here. Everything is short and sweet. Navigation- Click on the arrow after each description to go to the post. All blogs are for every kind of site unless specified at the very top of each post. Every single post is something that is site related. Learn about the importance of site-service. A quick trick on answering neomails in less time. A list of common mistakes seen throughout sites. Ever wondered why some sites have stories and others don't? Want to know if you should do the same for your site? The importance of credit is explained here. Much like the common mistakes, but these are usually minor ones. They won't usually count against review scores, but improve the site when fixed nonetheless. Discusses the usage of resources and extra graphics. Discusses the differences and importance of affiliates & listers. The saying is the saying goes. Service in running a site is key. Think in restaurant terms. When going to a restaurant, you expect to be shown a friendly smile and seated nicely. You expect to be served in a timely manner and if a mistake is made, an apology is common courtesy. The same thing goes for a site. Here are the steps in ensuring good service. 1. Make sure that your introduction is friendly and informative. Also, be sure to update your site regularly. Of course, there are sites such as graphic sites and guides that do not need to be updated everyday, but try to get one in at least every week or two. 2. Put in the extra effort to reach out to your visitors. Put links to your neomail or userlookup throughout the site and be sure to express your desire of wanting to help. 3. Always reply to neomails. I cannot stress this enough. Even if the message is asking a question you have already answered on your site, just kindly point them to the right section with a reply. 4. Finish requests in a timely manner. For graphic requests, a reasonable time-frame would be a week. Reviews would be about 1.5 weeks through 2. A layout would be about 2 weeks. 5. Tone is everything. Like with a friendly introduction, make sure your entire site has an air of friendliness. Phrase your sentences in a way that makes you seem approachable and ready to help. 6. Professionalism. What is it exactly? To me, it is the ability to remain calm when criticized and to make amends when in the wrong. As a site owner there will be times when unhappy visitors neomail you. However, it is your responsibility to remain calm and logically talk out the issue with the unhappy visitor. If they are wrong, correct them. If you are wrong, apologize. 7. Honesty. This is so important in being a site owner. Everyone knows that RL tends to get in the way. However, there is a difference in not completing a request at all and neomailing a requester about being unable to complete a request. Neomailing and explaining why the request will not be completed shows that you care and respect the requester. They took their time requesting and filling out the form so in turn, you should return the favor by telling them about their request status. If time is of the essence, a simple update on your site explaining your situation is fine as well. If you own a request site, at some point you will realize how tedious it is to have to type out a reply for every request. In order to save time, many site owners prewrite their accept and deny messages. Where do I put the messages? Many owners put it in their portfolio under a site category. However, you are free to put it anywhere you like such as having it saved on a notepad in your computer. What type of prewritten messages are there? There are a lot of options. Just write the ones that you will most likely use. For example, most request sites have one for accepted, denied, and completed requests. Other sites such as competition sites will need multiple ones such as competition announcements and closings. It is all up to you. What is the purpose of this? It saves time. All you have to do is spend about 5 minutes writing a few messages and saving it. Then, you are free to copy and paste the message whenever you have a request. Accepted: Hello! Your request as been accepted. I will notify you when it is completed. In the meantime, feel free to neomail me if you have any questions. Denied: Hello! I am sorry to say, but your request has been denied because of [state reason(s) here]. However, if you would still like to request, feel free to send in another one. Feel free to neomail me if you have any questions. Not aligning text to the left. Always align large bodies of text to the left because it makes your page easier to read. Only center small pieces of text and images (will get more into centered images later). Which one was easier to read? Hopefully you agree that the second one was. By having your text align to the left instead of centered, you can avoid the choppy formatting. Not linking name in your introduction to your userlookup. If you site does not offer requests, or require a lot of contact between you and the visitor, you should at the very least link your name to your userlookup. Why? Because it provides a way for visitors to neomail you if they have any questions or concerns. On the other hand, this is also important because it allows a way for your visitor to kind of get to know you. They can go to your userlookup and browse around such as reading what you have written there. Overall, the main reason is to provide a way to communicate. Inefficient space usage. There are some sites that I tend to come upon that have excessive scrolling due to the page not using its space wisely. Notice how in the second one, the images seemed to fill up the text box despite it only being 3 in total. By centering your images, your page physically looks better, but it is more filling. Also, the same goes for link back buttons. Always center. When in the process of opening up a site, many site owners debate over whether or not they want their site to have a certain theme and a story to go with it. Examples of these types of sites are The Teahouse and Parchment. Having a story throughout your site draws in the visitor's attention. They like the adventure of going through each page and putting themselves in the world that you imagined for your site. After all, a site is a place for you to express your creativity. However, not having a story is fine as well. There are plenty of amazing sites with a classic site structure and look such as Details and Project Star. Although these sites may have a theme, the sites themselves do not really expand more on it. Instead, the sites provide you the necessary information needed and get right into business. Deciding on a central theme and finding a layout that fits said theme. Often times this is tricky. Many sites offer CSS premades that allow you to edit to your liking, but this usually only works for experienced coders. There are also graphic based layouts, but the layout may not be what you envisioned. The best thing would be to request a layout, but open requests are often hard to come by. The process of writing the story. This step usually comes after deciding on a layout. Do you want the story to be scattered around your site or just on your homepage? If you decided to scatter your story throughout your site, you need to keep in mind that you are leading the visitor throughout your site until the very last page. Usually the story starts off right after the introduction in your homepage and ending with a brief good-bye message on your sitely page. Take a look at The Teahouse or Parchment as examples. If you decided on a homepage story, you only need to worry about writing a brief piece for your homepage. An example of this is A La Carte. Basically, you choose to open up your site with a story setting welcoming the visitor. Overall, a story driven site allows the visitor to interact more with the site. It also lets you create more creative features centering around your site. For example, when Sweeters Cafe was still open, I created an extra called The Recipe Book where I gave a little insight on how I write reviews and tips for future reviewers. That concludes this section. Having a story driven site will benefit the visitor by allowing them to interact with the site more. If the story is written well, the visitor will leave thinking about your site. However not having a story on your site is fine as well. You can still make sure visitors have an enjoyable experience by paying more attention to other factors such as service and extra features. When it comes down to it, it really is all up to the site owner of wanting to put in the extra effort of thinking up of a theme and writing a story to go with it. Even if you are new to the site community, chances are that you would still see the word credit and how much it is repeated on most sites. But if you are new, what does this really mean? The definition of credit is to give acknowledgement to a work you have used that is not yours. In other words, be sure to give credit to the person who's graphic or content that you have used. Why is giving credit important? Imagine you are in a group project with another person and it is a day before the due date and you both have not started. All of a sudden, your partner decides to back out because they are too "busy" and leaves you with all the work. So, you spend the entire night doing the project only to walk in the next day to hear your partner telling the teacher that they did all the work. How would you feel? I would assume angry or frustrated. This is the same with site owners. If you are going to use someone else's work, credit them because behind that piece of content may be hours or even days of work; so it is only courteous to give them the credit that they deserve. When you are using a graphic/code/resources that is not made by you. Anything that you find on a site that is not yours and you did not make needs to be credited. That includes coding. If you did not type it out by hand, and have copied it from another site, you need to mention it in your credits. When you are inspired by an idea. Yes, even ideas deserve credit. This is not to say that you need to credit a tutorial that taught you how to edit an image (though it is appreciated by the tutorial writer). What I mean is when you see a unique feature on a site that you like. For example, when Parchment added a story request station, other writing sites got inspiration from the rules. So to credit me, they listed it in the credits section of their site. How do you give credit? A textlink is the most common form of credit. Just simply have the link lead to the site where you got your content from. A textlink is usually placed in the credits section of the site. Linking back graphics to their original site. This is popular with link back buttons and random graphics around your site such as extra images and whatnot. This is also convenient for you as a site owner because you will not have to list where you got each graphic in the credit section. If you choose to link back your graphics, be sure to mention something in your credits along the lines of: All graphics not made by me link back to their creators. Overall, it is important to credit those who deserve it. A simple mention in the credits section or a linked graphic is a small price to pay for the creator's time. This post is very much like the common mistakes one. However, it is about minor mistakes. These small mistakes are not exactly mistakes, but more like they will make your site more convenient when fixed. As a reviewer, if I see these errors on your site, it will be unlikely for me to take off points in the review. But I would strongly recommend you to fix them. The first mistake is one that I see often in graphic sites. The mistake is not providing a code for your images. Granted, it is tedious to have a textarea code under every icon or banner, and not to mention, it takes up a lot of space. It is fine to not have a code under every graphic. Instead, provide a small textarea with a graphic code on top of your content page so that it is convenient for anyone who wants to use your graphic. An example of a site having tfhis feature would be Bedazzled. However, you can also view an example below. This way, people can easily plug in the image URL into a code and using the graphic right away. They would not have to type up their own. This is also an easy way to make sure you get credit for your work because the image would already link to your site if the visitor uses the code. The button above is one that I quickly whipped up. When you click on the button it leads you to the site it is made for (which is this one) and when you copy the code, the button will lead you directly back to where it was made. By having your button link back to your site in the coding, it guarantees that the site owner will give you credit. Overall, linking back the button to the site that requested will spread word about the site itself. 2. Everyone has heard of the great heroes of Neopia right? We have all heard of their legendary battles, and good deeds. We all know that they are always going to be around to protect Neopia with their lives. But what if a band of Neopia's most wanted and evils decide to join forces, and the final recruit is at the bottom of Maraqua? All of a sudden the heroes vanish and are not seen. What will Neopia do at this time of crisis? With all of this happening, a group of normal neopians travel up to Altador to visit the Hall of Heroes. Here, they acquire special abilities that the heroes have, and with the help of a certain janitor, they might just save the world. Which one was easier to read? Or which one did you prefer to read? I hope the second one was your answer. The shorter paragraphs provide a sort of break for the reader and kind of tricks them into thinking they are reading less than they have to. By breaking your wall of text into paragraphs, you can also separate your ideas, thus improving the organization in your site. Having linked borders on buttons and graphics is also a small mistake. This applies to all sites. Although there is no problem in having a linked border, it does not make your page very attractive. How can you tell if a graphic has a linked border? This is relatively simple. Take a button for example. If a button has a linked border, it will be surrounded by a black border. This makes the button look unattractive. Tiny div boxes. This is most common in review sites. Although there are not many active classic review sites at the moment, I would still like to point this out just in case someone is interested in opening one. Take a look at the div boxes on this page as an example. They are small but the right size for the content. They merely serve as a way for me to organize the different points and examples without having to create excess scrolling. The content inside these boxes are not lengthy. Now, think about how a review would look like in one of these boxes. Take a look at one of my reviews in the pick-up section. Imagine having to read an entire review in one of these boxes. One, it would most likely discourage you. Two, think of how much scrolling there is. In order to remedy this problem, you can simply make the div boxes larger to fit with the large text. Or you can put the review on a separate page all together. An example of a review site with a well-executed div box is Esteemed and for the review being on a completely separate page, just take a look at Indulge's pick-up section. Overall, make the div boxes the size that is appropriate to the situation. For updates, a smaller size is good enough. But for large bodies of texts such as reviews or guides, the box needs to be bigger. When you enter a site one of the first things you would notice are the resources and extra graphics used. The resources typically range from bullets, neomail signs, status signs, placeholders, and more. Extra graphics include icons, fake avatars, banners, pixels, etc. In this section, I am going to be talking about the importance of using resources and why extra graphics can be helpful. Resources are a great way to draw attention to important aspects of your site such as request statuses and neomail links. Of course, there is nothing wrong with having a regular text link or bolded status sign. But, what exactly are resources? Resources are anything that is used to help your site function. In other words, think of them as signs. They can point you in the right direction, show you status updates, or lead you to another page. Commonly used resources are bullets, neomail signs, status signs, and placeholders. There are more, but these are the most used. Bullets can help organize rules or lists. Unlike coding your own bullets, using a graphic bullet provides that extra pop of color to your site. Neomail signs lead you directly to blank message. Status signs show you if the site owner is currently available to take requests. Finally, placeholders are used in place of graphics. For example, I would use a button placeholder to show that a button is meant to go in a certain spot. These are temporary and will be replaced with the graphic that you intended for that spot. Extra graphics are usually a great touch to any site. These graphics are different from resources in that they are not necessarily needed for a site to function. They are mainly there for decoration. Then, why are they important? They are important because they can really liven up a page. Sometimes it is nice to have a picture to look at when reading a large body of text. An example of this would be any of the posts in this site. I make sure that each post has a fun image to tie it together. They are also a great way to fill in any empty space. If there are only a few words or a textbox on a page, just add a banner or icon to give an illusion of the page being filled. First, look at the ones that complement your site's theme/color scheme. The colors that go well with my site are mainly purple, pink, and gray so I gathered resources of those colors. Next, pick the one style that you like best and will be most effective. For me, I chose the third one because I kept in mind of my site's textarea sizes. It aligns perfectly with my textarea and evens out my page. This strategy can be used with all resources. Make sure that the colors match your site and be consistent when using them. Have one style of neomail signs, status signs, bullets, etc throughout your entire site. This will improve the overall aesthetics of your site. The over and ineffective use of extra graphics can also tie into the reasons with the resources. The difference with graphics is that they do not have to be the same every time you use them and the colors do not necessarily have to match your site's color scheme. Of course, if they do, your site will appear more consistent. The main thing that you need to look out for is to not pile the graphics on a page (unless your site is a graphic site and it's your content page). But if you're just using a graphic for decoration, try limiting it to maximum of two graphics to each page. This also depends on how much text is on a page. If the page is text-heavy, then more graphics will help alleviate the pain of reading through the large body. Overall, resources and extra graphics are a great way to enhance your site and aesthetics. Resources are a helpful way to guiding your visitors and extra graphics contribute to your site's charm. No matter how you use your resources and graphics, be sure to be consistent and not overuse them. When I first started as a site owner, I was confused about the whole process of becoming an affiliate and getting listed at directories. Firstly, I did not know what affiliate meant, so it took me a while to get the hang of things. Hopefully, this post will save you the trouble of learning the difference on your own. This post will be especially helpful to new site owners. What is an affiliate? An affiliate is someone/something that is connected to you/your organization. In this case, your organization is your site. What is the purpose of an affiliate? An affiliate in some sense, gives your site exposure. The more affiliates you have, the more likely people are going to stumble upon your site because they will see your button displayed. However, affiliates do not only serve as a way to get your site out there. They are also there to help you. Think of your affiliates as a sort of support group. If you have questions, you should feel comfortable enough to ask them. Is it necessary to have affiliates? No, it is not. It is completely up to you whether you choose to have affiliates or not. There are other ways to make your site known. How do you decide which sites you should become affiliated with? This is also completely up to you. However, most site owners choose to become affiliates with sites that are similar to theirs. For example, a button site will more likely become affiliates with another button site than a review site, and vice versa. Hello ____! I was wondering if you would like your site, ______, to be affiliates with mine, ______? Thank you for considering! I hope you have a nice day! If your affiliate request is not accept, do not despair. There will always be other sites that are willing to accept. Listers are what we call directories that are listing your site. How do you get your site listed? Simply visit a directory such as The Popsicle Stand or Kalux Directory and send in your listing request. Most directories have a pre-written form that you need to fill out. The only thing you need to check before sending your mail is check if the site is accepting listing requests. What if you see your site listed at a directory that you have not requested to be listed at? This is a completely normal occurrence. Directories are meant to help people find what they need so it is natural that the site owners will try to list as many sites as possible, and your site could be one of them. When you see this, just put one of their link back buttons or link back to the directory in your Listers section of the sitely page. Do you really need listers? Well, no. However, getting your site listed at directories is the easiest way to get your site known. This is especially helpful if your site does not have affiliates. However, if your site is more of a personal page and you would prefer for it to not be listed, you can just neomail the site owner and they will be able to remove your site. That concludes this section! Basically, both affiliates and listers are ways to get word of your site out there. For affiliates, do not be afraid to be the one to send out the request! Most site owners are more than happy to receive neomails. And the same goes for listing requests. Just send it! I hope this article helped! From time to time I get the urge to review so this section is for that. Requests will open randomly so check frequently if you're interested. Also, be sure to read the rules below before requesting. Be sure to link back before you request a review. Credit is mandatory. Keep in mind that the review is my opinion so please be polite. Also, be sure to read each rubric carefully before requesting. Only request when requests are open and one request at a time. If you read the rules, include your favorite dessert somewhere in the form. Select the rubric that you want, and be sure to fill out the form completely. Also, do not make any big changes to your site while you are on the waiting list. Homepage: This includes everything on your homepage. The introduction is the part where you introduce yourself and your site to others. See if your introduction made sense, and did your name link back to your userlookup. Also, see if your introduction told enough information on your site and if the page is organized. Rules: Are your rules fair? Do you sound too harsh? Do they make sense? Easy to understand? Layout and Organization: Your layout is very important because it's the first impression that the visitors see when they enter your site. Looking to see if your layout is pleasing to the eye, and if it's organized. See if your site's navigation works and is easy to spot and use. Also take a quick glance through your site to see if anything is out of place, or needs to be positioned a bit better. Spelling and Grammar: This is a quick read through your site to see if there are any mistakes. Sitely: The sitely part of your site usually contains Link Backs, Affiliates, Listers, and your Credits. Critique your link back buttons to see if they are high quality. Content: Your content is the most important thing on your site because it lets others know what you have. See if you organized your content in a manner that is easy to access and use. Is it neat? Are the textarea/textboxes the right size? Your content's quality will also be scored on here. Pros: What is good about your site. This review can be in bullets. Some things to comment on can be layout, content, organization, spelling/grammar, anything that is positive and stands out. Cons: Some of the things that you need to improve on as well as ways that you can fix it. Some things to comment on can be layout, content, organization, spelling/grammar, anything that you think can be/needs to be improved. First Impression: What do you first see when you enter your site? Does anything stand out? What do you like and don't like? Go over your site's introduction, and see if it has all the necessary requirements such as your name linking back to your userlookup, information about site, and neomail link. Spelling and Grammar: This is a quick read through your site if there are any mistakes. This is a simple questions and answers review. You will be able to ask questions about your site and I will do my best to answer them. This type of review is always open even when requests are closed and will be done through neomail. When requesting this rubric, be sure to include all your answers in the form. How should I organize my sitely page? What do you think of my introduction? Is there any way that I can improve it? Is my site organization okay? If not, how can I improve? *Please make the subject Review Request Name: Site Name & URL: (ex. NAME; /~PETNAME) Type of Site: Chosen Rubric: Why do you want to be reviewed? Did you read the rules? How did you find Indulge? (optional) Anything else? This is where you can pick up your review requests. Nav | In-depth | 11/02/18 | Read more? Angela | Pro/Con | 06/14/18 | Read more? Jewlz | In-depth | 07/15/18 | Read more? Amina | Pro/Con | 06/03/18 | Read more? Molly | In-depth | 09/22/18 | Read more? There is really nothing to say about your homepage. You introduce your site nicely in your introduction as well as make your site's goal clear. The only thing that I would fix is maybe bold or italicize key words in your introduction. Examples include the type of site and your goals. Overall, nice job here. Your rules are all straightforward and fair. Everything was clear and easy to understand. All your links work and everything is organized nicely. Your layout is also well-made and easy to navigate. The way that you organized your content is simple and convenient. Great job here! Homepage: Founded in on January 2018 by none other than NAV, Howlite's goal is to supply you with quality Neo-related & basic buttons to suit your every need. Request - Topaz Request: This type of request gives me total free reign over your button. Tools: This wonderful collection of goodies is used to create Opal requests, however, they can also be used by anyone at their leisure. Everything seems to be in order in your sitely page. The page is organized nicely and everything is easy to find. There are, however, a few link back buttons that can be replaced. The simple border and text on this button is well done, but what takes away from the quality is the snow animation. It's choppy and not smooth. Here is a great snow tutorial to help you out. Here, your image and border are excellent. What weakens this button is the text. It's too small and does not stand out. At this point, I suggest playing around with styling and positioning. Instead of having the moon to the side, try centering it along with the text. If you are concerned with the text blocking the image by being centered, switch up the animation. Maybe use the textfade animation or have the text scroll across the button. Also, feel free to play with how the text itself looks. Again, the image is nicely cropped, border is great, and animation is decently timed. What needs to be fixed is the text. The white text goes great with this button as it makes it stand out, but the text itself is blurry. I suggest either selecting a different font or sharpening the text. For this section, I will review your most recent buttons. I will be picking out the buttons that can be improved as well as your best ones. The animation for this button is nicely timed and the border is also well-done. However, the text and image is what brings the quality down. It's hard to make out what the image is and since the text is long, I feel like the execution could have been better. For longer texts, a little more creativity is needed. If you would like to stick with the image, I suggest brightening it up a bit so that it's easier to see what it is and have the text scroll behind the image. Everything about this button is nicely done except the animation. Notice how the petals continuously block the text? This makes it a bit hard to read. I suggest creating a small gap between animations or slowing it down so that the petals fall softer. An example of a well-executed button of yours with a similar style is the Meet the Fam one. This button is very well-made. The image cropping is nicely done and the colors to the text execution are great. The border also neatly ties the image and animation together. This is your highest quality button so far. The colors on this button go well together and the image is nicely cropped. The shine animation is also perfectly paced and isn't too harsh. Great job! Overall, you have a wide variety of options to choose from for button customizations. It was also nice to see that you're open to experimenting with different animations. Your strongest points are image cropping and editing. You still need to work on the quality of your animations and text execution. For animations, you seem to have the concept down, but not when to use it in order to enhance a button's appearance (especially with longer texts). Text execution can also go with animation. You're strong in shorter texts, but play around with longer ones. For example, with longer texts, try staying away from using a png on the button. Instead, opt for a scenic background and center the text. Once you manage to master editing the text on a scenic background, then you can move onto a png and experiment with animations regarding that. I will definitely revisit to see what else you have to offer as well as how you improve. You're animations are creative and I can't wait to see what else you come up with. This is not exactly a definite no. It's leaning towards a maybe because I see a lot of potential. This recommendation is based solely on your content so far. You're on the right track regarding image cropping and editing, however, there's still room for improvement in animation and text execution. These really take away from the button's overall quality. With tweaks here and there to your buttons, your site will definitely shine. This is also where I usually recommend active review sites, but there are currently none. If there is anything that you are curious about, take a look at the content page for additional site tips. Below are a couple of sites with button tutorials regarding animation and other tips in order to help you improve your button making even more. Other Comments: I noticed that a few of your link back buttons are not made by you. This is completely fine, but I suggest switching them out to ones that you made because you're running a button site. This is a great way to show off your technique to others who see your site's buttons or use it. Think of it as you advertising your site and showing your style. If you choose to do this, it does not mean you have to discard the buttons made by other sites completely. I suggest putting them on a separate page or section with a note saying they're not made by you. Remember to link back! (Goes right under the 'reviewed by' section) I have added your review and everything in the button below. When you roll over the button after pasting on your site, you will be able to see your score. Hope the review was helpful! Your site is easy to get around. All the links work. Everything in your site is well explained and easy to understand. For your requests, it is nice to see different request options and styles. This gives your visitors more of a variety to choose from. Your fonts overall are well made. The colors go well together and match nicely with their avatars. There are a few tweaks that you can make towards your organization. Let's start by reorganizing your navigation so that your site flows better. Organize it in this order: Home, Premades, Font Menu, Request, Art Trades, Pick-up, Portfolio, Extras, and Sitely. You may have noticed that I took out Sparkle Lines. This is because I think it's best if you combine it with your Font Menu. Like I mentioned above, there is excessive scrolling throughout your site. This can easily be fixed by separating each section into pages. An example of this is my extras and your Premades page. Notice how each of my categories and your different fonts are separated into a page of their own? By separating your categories, it will be easier for you and the visitor to find what they are looking for. 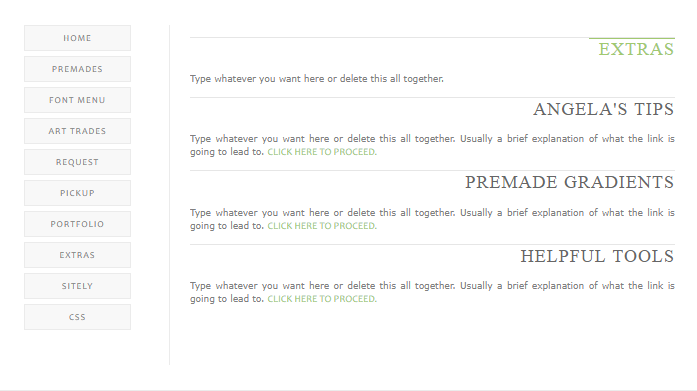 I reorganized your extras page for you as well as coded your categories into different pages. Below is a preview of what it should look like if you choose to use my code. Here is the coding for your extras page and the categories that go with it. I also added a back resource to lead you back to your extras page from The Lunch Box so if you decide to keep the back buttons, be sure to credit. In order to use your code, just replace all your coding for your extras section with what I have below. Type whatever you want here or delete this all together. Type whatever you want here or delete this all together. Usually a brief explanation of what the link is going to lead to. Click here to proceed. You can also do what you did for your extras page with your font menu. You can have each style in their separate page as well as create another one for Sparkle Lines. Another minor thing you can do to fix the horizontal scrolling throughout your site is to change the width of your font screenshots to about 450px or less Finally, I suggest you create a credits section in your Sitely page. This will make it easier for you to give credit to where you found your resources and graphics. This is where I usually recommend active review sites, but there are currently none. If there is anything that you are curious about, take a look at the content page for additional site tips. Upon entering your site, my eyes were immediately drawn to the banner. The colors used complement your site nicely. There really is not much to say about your homepage. Everything was neatly organized and the introduction was straight to the point. You also did a nice job of explaining what your site is about in your introduction. Great job here! Since your site is not a regular request/content-based site, you do not have one set of rules (which is fine and understandable). However, each section was clearly explained and easy to understand. Your layout itself is nicely made. The color scheme makes the site pleasing to look at. Each page is well organized. The way that you organized the news is convenient and makes it easy to read. There really is not much to say here. All your links seem to work, and the navigation is easy to see and use. About the Site: Sites that do not offer requests are welcome to send in news about their sites via the bulletin board or the poster board. Submit a Bulletin (Last sentence): Please do not submit for guilds, auctions, shops, galleries, ect. Interview Guidelines (1st bullet): Anyone can interview a site owner and submit a poster. Site Ratings: If you have requested from a site on our watchlist, you can submit a simple star rating review to us so others can see what sites do the best work. Everything seems to be in order in your sitely page. The page is organized nicely and everything is easy to find. One thing that I suggest you add is the code to remove linked borders to your button codes: border = 0. Remember to put quotation marks around the 0 and remove spaces. There are, however, a few link back buttons that can be replaced. The text on this button is well-executed, but what brings the quality of this button down are the images used in the animation. The animation runs smoothly, but the images in each frame are hard to make out. The image on this button is nicely cropped. The text and border is also done nicely. What brings this button down is the animation. The snow animation fits this button perfectly, but the animation itself appears choppy, as if it were lagging. If the animation was smoother, this button would be great! You have a wide variety of sites listed, which makes your site much more convenient. Visitors who are looking for a particular request site that is active will only have to look at one place. I also like how you try to turn your site into more of a community site for both site owners and requesters. Everything from the main directory to the posters and news was well thought out. However, I do have a few suggestions to make that may improve your site even more. Interviews: The idea of getting to interview site owners is a great idea! But to start it off, maybe provide an example of an actual interview rather than a sample format? For example, to start off, perhaps you can do an interview of your most recent featured site. This way, more people will see how an interview can be done, and hopefully become inspired to participate as well. Poster Requests: In your poster guidelines, you wrote, You do not need to make your own poster. Tell the maker to leave a small credit somewhere on the poster. Where can someone request a poster if they do not know how to make one? Maybe you can create a section (in the extras page?) where site owners can volunteer to be a poster maker for Refresh. When someone wants to create a poster, they can request one from a poster maker with open requests. Overall, the newly revamped Refresh seems to be off to a great start! I will definitely revisit to keep up to date with site news. I would recommend Refresh because it is not only a great resource for site owners, but for anyone who is looking for an active request site. Your site is well organized and easy to get around. All the links work and each page is structured nicely. You do a good job of explaining what your site is about in your introduction. It's great that you bolded all of the important aspects, which makes it even easier to read. From what you have up, your current tutorials are well-written and in-depth. You do a nice job of transitioning into the next steps and providing visual references. Your buttons are nicely colored and the animations are well-executed. For example, I really like your shine. The animation is not too harsh. It is easy on the eyes and brings out the best in the button. I noticed that the regular text in your gray div boxes are all written in lowercase aside from the bold parts. I suggest changing it so that you can capitalize the words that should be. The Basics: This tutorial was well-written. You did a nice job explaining each step and walking us through it. However, there are some things that can be tweaked to improve. For example, you talked a lot about pixel fonts. However, you kind of glossed over non-pixel fonts. I suggest providing some more examples of when non-pixel fonts can be used. Is it best to use with short sites names? What is the best way to use it? You can also provide a visual example of when a non-pixel font can be used. Although everything was easy to understand, I suggest doing one more grammar sweep throughout your site. Particularly in your tutorial section. There are a few spots where sentences need to be rewritten and words can be replaced. The animation for both buttons are well thought out and the images are nicely cropped. However, the first button's text can be tweaked. The text is already thin and tiny, so when you have the light spot on the text, it makes it even harder to see because it makes it blend into the white shadow behind it. For the second button, the image is overly sharpened. I suggest toning it down a bit. This will make it easier to see. Overall, your seem to have mastered colorscheme and animation. With a few tweaks your buttons will be even better! This is not really a con so I did not put it under that section. For your tutorials, I suggest defining certain terms that you use such as primary shadow hue and primary midtone hue. Basically any vocabulary that beginners would not know. I think this will make your tutorials easier to understand. This is also where I usually recommend active review sites, but there are currently none. If there is anything that you are curious about, take a look at the content page for additional site tips or here for a list of helpful sites. 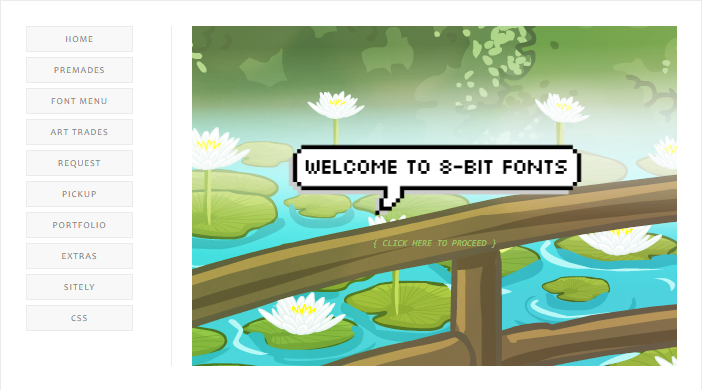 Welcome to Moonlight Fonts run by me, Molly. Here, you will be able to find premade and custom neoboard fonts. MLF officially opened on June 10, 2018, and grows more and more every day. Take a look around! Overall, everything on your homepage is looking great! All your rules for both premades and customs were clear and easy to understand. Your layout itself is nicely made. The color scheme and layout is really simple and easy to navigate. Each page is well organized and all your links seem to work. Premade Rules: IF YOU would LIKE A NB PEN FONT, BUT DON'T HAVE A NB PEN, FEEL FREE TO ASK ME TO MAKE THE CODE SHORTER FOR YOU! YOU CAN ASK ME TO DO THIS AT ANY TIME, EVEN IF REQUESTS ARE CLOSED. Premade & Request Rules: YOU MAY EDIT MY FONTS, but DO NOT CLAIM THEM AS YOURS. Everything seems to be in order in your sitely page. The page is organized nicely and everything is easy to find. There is, however, a link back button that can be replaced. The image on this button is nicely cropped and the sparkle animation is smooth, but what brings the quality of this button down is the text. The appear animation does not seem to fully loop before starting over again. This makes the text on the lighter side and harder to read. The fonts that you have up so far are well made. The colors go nicely with the avatars, and I like how simple they are. However, every font seems to be done in similar styles. I suggest playing around more with font structure and style. For example, instead of having the phrases evenly aligned, how about make it choppy and uneven? Or instead of using one symbol for a font, try using more to mess around with the structure. For example, if you are using the Gloomy avatar, you can try using a cloud and raindrops falling under it. The fonts overall are great, but I would like to see more of your personal style. I will definitely revisit to see your future work. I would recommend Moonlight Fonts because the fonts are well-made and fit the avatars nicely. This is just a suggestion, but maybe you can add an extras page to your site? This will allow you to work on more projects involving your site as well as make it stand out more. For example, you can add a recommended color scheme section or other font-related features. Here you can find extra features that you can explore. Here, you can read the continuation of the site story and the reasons why this site was opened. A list of sites that are useful for site-improvement. A place where all my past reviews go. Have something you want to see? This is the place to tell me. The first part is the continuation of the story in the homepage. Below that is the reason why this site was opened. After she gets you seated and tells you to take your time ordering, she goes back to the group of people at the counter and hands them their packed orders after a small chat. Then, she walks back to you and asks you what you would like to order. 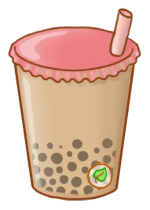 You scan the menu for a moment and decide on a Sweeters Cupcake and a Bubble Tea. Upon hearing your order, Tiffany gives you a small smile and quickly notes it down. A few minutes later, she comes back with your order and places it in front of you. Please enjoy and call me if you need anything, She says before going back into the kitchen. You thank her and dig into your food. 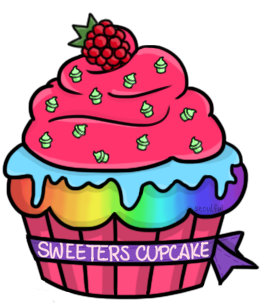 The cupcake, you observe, contains all the colors of the rainbow and topped with cupcake shaped sprinkles along with a raspberry. Interesting, you think to yourself. Without waiting another moment, you dig in. The cupcake is sweet, but not so sweet that it gets tiring. The cake itself is perfectly moist and the pink lemon buttercream frosting adds just the right amount of zest. As for the flavor of the cake, you can't put your finger on it. You taste vanilla, chocolate, a mixed variety of berries, but there is something else. Something that ties all of the bizarre combination of flavors together. Before you knew it, you have already finished the cupcake. So then you move onto the tea. The first sip cools down your body and relaxes you immediately. There is a slight bitter tea taste, but it immediately washes away when you bite into the boba. What a perfect way to end the snack. You take a look around the cafe while sipping your tea. You see pictures on the walls of past customers with Tiffany. She looks younger, you think to yourself. Tiffany comes back and places the bill on your table and tells you to take your time. There was no one in the cafe now so you stop her and ask her about the pictures on the walls. When she hears your question, another small smile pulls at her lips as she turns her gaze towards the pictures. After a moment of comfortable silence, Tiffany pulls out of her thoughts and says, As you have already guessed, these are my past customers. She pauses for a second as if she were debating whether or not she should say the next part. She walks over to a smaller picture and brings it over to your table to show you. These pictures were not taken here at this cafe. Rather, they were at my first one, Sweeters Cafe. However, that cafe is long gone now. Though, there are some instances where long-term customers come back and visit, She says with a kind of wistful tone as she stares at the picture on the table. At this moment, you realize that the group of people who was talking so happily were a group of her old visitors. No wonder they were so familiar with each other, you think. You take a look at the picture and see a building slightly larger than the one you are sitting in. The cafe in the picture had a small outdoor seating area and sitting there was Tiffany surrounded by a group of friends. What catches your attention most in the picture are the three cupcakes in the middle of the table. One of them is the cupcake that you just had moments before. You point out the cupcake and ask Tiffany if it is the same one you just had. She nods and says, It is. That cupcake was Sweeters Cafe's specialty. It is made with all of the ingredients used in the other cupcakes and baked treats along with an extra ingredient to tie it all together. I remember everyone wanted one of the cupcakes when it first came out. Her eyes sparkled as she recalled these memories. But, all good things have to come to an end, Tiffany sighs as she puts back the picture. Now, I am just a tired baker who yearns for a time when the cafe was still bustling with life. She turns to look at you and for a moment, her eyes lights up. But people like you are what keeps me coming back to the kitchen, She says with a bit more energy than before, I may not have the same energy as I did when I first opened Sweeters Cafe, but I am willing to pass down my knowledge in the business if you're interested? Tiffany puts out her hand and you stare at it as you debate whether you are ready or not to apprentice under her. So, will you take her hand or not? Indulge is an extension of my now closed review site, Sweeters Cafe. Now that Sweeters Cafe is closed, I noticed that the site community lacked review sites. However, I did not want to get back into reviewing due to my busy schedule. So then, I took some time to mull it over. New sites were constantly popping up, but there was no one new owners could turn to for advice on how to improve. Granted, there were plenty of site guides, but most were out-dated. So, I was inspired to create Indulge. Indulge started off as a self-reviewing site where the site owner could actually go through the process of being a reviewer for their own site. However, that project fell through and was not completed. After several months of thinking, I still felt like the site community needed something it could turn to for help. Thus, the Indulge help site emerged. This way, I will be able to update as I like as well as have a site that will never truly be completed. I also felt that with it being written as a blog, it will be a quick and easy read. Below is a checklist to a successful site. Not everything on the list is referring to every site. Single out the parts that you think applies to your site. [ ] Well organized layout. Are all of the links working? Is everything easy to find and nicely laid out? [ ] Goals, Spelling & Grammar. Did you clearly state your goal and purpose of your site in the introduction? Is the writing in your site clear? Is it easy to understand? [ ] Content. High quality? Is there quantity? Is it organized properly? [ ] Service. Are you responding to neomails regularly? Are you friendly with the visitor/requester? Are the forms and rules easy to follow? Are you open to suggestions? Here are some sites to help you on your site making journey. Be sure to read the descriptions for each site. Atlas is your one stop shop to finding out all about the different types of site there is. Here, you will find information on each type of site and the responsibilities that come with it. This is a great read for those wanting to create a site, but do not know where to start. 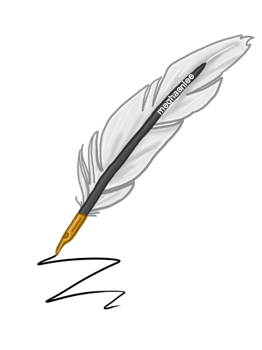 How to Write for the Web and Talia's Writing Guide are both great guides to writing. Both guides show you how to properly structure your writing as well as keep your visitor engaged. Before creating a site you will need a name and this site will help you with just that. There are a wide variety of names throughout this site, so I'm sure there will be one that appeals to you. This site is also filled with broken images. However, that can be overlooked because the information in here is just as valuable as these other guides. This site is your basic how-to-run-a-site guide. Perfect for new site owners. If How to Write Great Reviews was too hard to read because of the broken images, give this guide a try instead. Everything is still mostly intact. This is also another guide to reviewing. This is a guide to owning a link directory. This site provides in-depth explanations on how to make your link directory successful as well as extra pointers. This page is a great read for both new and veteran directory owners. This is a great read for those who own request sites. It provides in-depth explanations on the importance of providing service. Highly recommended read for everyone who is interested in owning a site. This site has in-depth articles on how to write reviews and tips on running a review site. Even now, I still often refer to this guide to help me write reviews. Highly recommended read for those interested in becoming a reviewer. A simple guide on how to run a successful site. This site will give you the basics of running your site to help you get started. Good for new owners. For my full portfolio, click here and scroll all the way down. As for the requests completed at Indulge, I have completed 9 in total. Roll over each button for the score. Is there anything that you would like to see on this site? You can request that here. Suggestions can range from new posts to more content on various subjects. Suggestions are always open. Layout from Floral, edited by me (tdog_19). Coding for banner from Nienke. Background from Whitespace Resource. Banner created by me (tdog_19).